Early nicknames for the university's athletic teams included the "Hawkeyes" (which is now associated with the University of Iowa ), the "Antelopes" (which the University of Nebraska at Kearney later adopted), the "Old Gold Knights", the "Bugeaters" and the "Mankilling Mastodons". The name Cornhuskers first appeared in the school newspaper as "We Have Met The Cornhuskers And They Are Ours" referring to a 20-18 upset victory over Iowa in 1893. The name would be used again, this time to refer to Nebraska by Charles "Cy" Sherman in The Nebraska State Journal during the 1899 season and would replace all other names by 1900. The Cornhuskers have two official mascots, Herbie Husker and Lil' Red. The Cornhuskers participate in all sports in the Big 12 except for men's swimming and diving. In addition the Huskers play in three non-sponsor Big 12 events, Rifle, Bowling and Men's gym. Men's Gym is in the Mountain Pacific Sports Federation, Rifle is in the GARC and Bowling is independent. The Husker football team began competitive play in 1890 and has claimed 46 conference championships and part or all of five national championships: 1970, 1971, 1994, 1995, and 1997. The latter three marking one of only two times that a team has won three NCAA Division I-A national football championships in four seasons. The other was Notre Dame in 1946, 1947 and 1949. Over the past 25 years, the Huskers' three Division I national championships are the second most of any Division I university, behind only the University of Miami, which has won five. The coach who brought about the most wins in Cornhusker history is Tom Osborne, who led the team for 25 seasons, from 1973 to 1997; his final record at Nebraska was 255–49–3. During his tenure, the team won three national titles, including one in his final season. Nebraska's home games always open with the Tunnel Walk, which signifies the entry of the team onto the field. 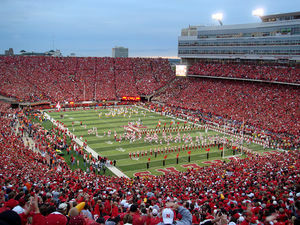 When the Cornhuskers play at home in Memorial Stadium , the stadium holds more people than Bellevue (the third-largest city in Nebraska). The current attendance record was set on September 26, 2009 when 86,304 fans filled the stadium. They currently hold the NCAA record for the most consecutive sold out home games; the sellout streak dates back to November 3, 1962. The most recent Husker coach was Bill Callahan, (after being fired by interim Athletic Director Tom Osborne on November 24, 2007); the previous three coaches were Frank Solich, Tom Osborne, and Bob Devaney. Callahan represented a break from tradition in many ways. First, Callahan was the first head coach since 1956 not to be hand-picked by his predecessor. Second, Bill Callahan had implemented the West Coast Offense at Nebraska. The Huskers had previously been known for the tough running game; specifically, running the option with a strong backfield, while their new style relies heavily on a balance between the run and the pass. Nebraska achieved 800 lifetime wins on October 14, 2006 with a 21–3 victory over Kansas State. There are presently seven teams with 800 wins: Texas, Notre Dame, Michigan, Nebraska, Ohio State, Penn State, and Alabama. On December 2, 2007 athletic director Tom Osborne named Bo Pelini head football coach at Nebraska. Bo Pelini took the job, leaving his position as defensive coordinator at LSU after the 2008 National Championship win against Ohio State. Pelini was defensive coordinator at Nebraska in 2003 and was interim head coach for the 2003 Alamo Bowl game replacing former head coach Frank Solich. Coach Pelini went on to win the bowl game making him 1–0 as head coach at Nebraska. The Cornhuskers had a 8–4 record for the 2008 season bringing Coach Pelini's all-time head coaching record 9–4. Nebraska played in the Gator Bowl on January 1st, 2009, against the Clemson Tigers. This is the first bowl game invitation since the Cotton Bowl in 2007, under previous coach Bill "Douche-Magoosh" Callahan. They beat the Clemson Tigers 26–21 at this bowl game. On Saturday, September 26, 2009 a record crowd of 86,304 people watched the Cornhuskers play Louisiana-Lafayette. It was the largest crowd to attend Memorial Stadium yet. It also happened to be the NCAA Record 300th Consecutive Sellout of Memorial Stadium. Nebraska is home to one of the nation's most storied collegiate women's volleyball programs. The Nebraska women's volleyball team has won three NCAA Women's Volleyball National Championships, in 1995, 2000, and 2006 and has had three NCAA National Runner-Up finishes in 1986, 1989, and 2005 as well as 5 other NCAA National Semifinal appearances in 1990, 1996, 1998, 2001, and 2008 bringing the program total to 11 NCAA Final Four appearances. The Nebraska program is second only to Stanford in all-time NCAA Tournament wins, all-time NCAA Tournament winning percentage, number of NCAA National Semifinal appearances, and in the number of NCAA National Championships won. Nebraska has made an NCAA Tournament appearance in every year of the tournament's existence except for the tournament's first year in 1981. Nebraska has had more combined AVCA 1st and 2nd team All-Americans than any other program, tops the nation in the number of AVCA 1st team All-Americans, and has produced 4 AVCA National Player of the Year award winners. Nebraska also is one of only three programs east of the west coast to have won a NCAA Women's Volleyball National Championship. Nebraska volleyball is a very popular spectator sport in the state. In 2008, AVCA executive director Kathy DeBoer described Nebraska as "the epicenter of volleyball fandom". The four largest ever NCAA volleyball crowds were in the state of Nebraska, including the largest ever crowd of 17,209 for the 2006 National Championship game between Nebraska and Stanford. In 2005, an NCAA volleyball-record 13,252 tickets were pre-sold for the NCAA regionals. The vast majority of these sales are attributed to Nebraska volleyball fans, as these games were played at the Qwest Center in Omaha . The Huskers also have the ongoing NCAA record for consecutive home sellouts in a women's sport at the Nebraska Coliseum in Lincoln. The 4,030-seat Nebraska Coliseum has provided the Nebraska volleyball program with an unmatched home-court advantage. Nebraska has had 15 undefeated seasons at home compiling an all-time record of 454-30 (.938) under its roof. Only three times in 33 years of regular-season Big Eight/Big 12 play has a conference opponent ever won in Lincoln. At the Coliseum , the Huskers are the current holders of the NCAA record for the most consecutive sellouts in a women's sport. The Nebraska Coliseum is one of the few collegiate arenas that is designed specifically for volleyball. It is noted for its classical architecture, intimate setting with fans close to the floor, perpetually sold-out crowds, and deafening acoustics. The Coliseum has statistically proven to be one of the most difficult venues for visiting teams to win in all of sports, has anecdotally been described as 'the arena that the volleyball gods would build', and has drawn comparisons to Duke's Cameron Indoor Stadium due to its design, acoustics, and intimate atmosphere. It has also been the subject of a CBS Sports documentary. Nebraska became the first team in the Big Eight to create women's soccer as a varsity sport in the 1995 season. John Walker was hired to coach the soccer team in April 1994 and was determined to get the Huskers into an NCAA tournament by 2008. During his second season, he led the Huskers to the NCAA tournament followed by an addition nine consecutive trips to the tournament, with his first miss in the 2006 season. The team has reached the Sweet sixteen eight times and to the Elite Eight on two occasions. John Walker has earned NSCAA/Umbro National Coach-of-the-Year, NSCAA/Umbro Central Region Coach-of-the-Year and Big 12 Conference Coach-of-the-Year over his tenure at Lincoln. The Husker program has created many professional athletes that went on to the WUSA. The Nebraska Cornhuskers field both a male and female cross country team coached by Jay Dirksen. They currently run on a course through Pioneer's Park in Lincoln. The men's team started in 1938 and the women's team started in 1975 as a result of title IX. The Nebraska Cornhuskers have never won a Big 12 conference championship. The only men's conference championship was in 1940 Big Six meet. The women have won the conference championship 5 times. While the University of Nebraska has experienced varying amounts of success for their intercollegiate athletic programs, men's basketball has been an exception. Nebraska has not won a conference title since sharing the Big Seven Conference with Kansas and Kansas State in 1950, and they haven't won an outright conference title since going a perfect 12–0 through the Missouri Valley Intercollegiate Athletics Association in 1916. Nebraska has a distinction of one of the few major conference programs never to win a single game in the NCAA Tournament. In fact, in the over 90 years of varsity competition at the University, the first trip to the NCAA Tournament for Nebraska did not come until 1986. Much of the team's success came under the tenure of Danny Nee, head coach from 1987 to 2000. Nee is the team's all-time winningest head coach with a record of 254–190. Nee led the Cornhuskers to five of their six NCAA Tournament appearances, six bids to the National Invitation Tournament, including the 1996 NIT Championship. The current head coach is Doc Sadler. Barry Collier, who led Nebraska from 2000 to August 2006, left to become athletic director at Butler University. He previously had been Butler's head coach from 1989 to 2000. Women’s basketball started as a club sport in 1970 and five years later it became a varsity sport when scholarships were offered. George Nicodemus was the first head coach and had a 22-9 record in his first season, taking the Huskers to the AIAW where they lost in the second round of the tournament. Five different head coaches would be hired after Nicodemus left the program in 1971 until 1986 when Angela Beck took a stable head coach position. Beck led the Huskers to their first NCAA bid after winning the Big 8 championship in 1988. She led the Huskers back to the NCAA in 93 and 96. She left the program in 1996 to pursue other opportunities and was replaced by Paul Sanderford. Sanderford led the Huskers to a NCAA sub-regional in 1998 and 1999 and received a third consecutive NCAA bid in 2000. Connie Yori became the head coach in 2002 and has led the Huskers to WNIT in 2004, 2005, 2006, and NCAA in 2007 and 2008. The first official Nebraska wrestling team started in 1910 with Dr. R.G. Clapp as coach. The Nebraska Women’s Gymnastics team was first established in 1975. After the first season, the school hired head coach Karen Balke to lead a team of all freshman and sophomores for one year. Judy Schalk took over as head coach in 1977 until 1983. She led the Huskers to five conference titles and to one AIWA bid. In 1983, Rick Walton was hired to serve as head coach and led the Huskers to their first NCAA women’s gym event title when Michele Bryant came in first place on the vault. He captured four straight Big 8 championship titles and led the huskers to the NCAAs four times in a row. After the 1993 season, Rick Walton left the program and Dan Kendig was brought in. In his first year he became the Big 12 coach of the year after leading the Huskers to a Big 8 championship. In 1997 the Huskers reached the Super Six Finals for the first time by beating #1 ranked Utah. Kendig was named national coach of the year in 1999 after earning 6 conference championships in a row. Kendig's team has won four event titles when Heather Brink won two NCAA event titles in all around and vault in 2000 and Richelle Simpson won the all around title and the floor exercise title in 2003. The huskers have never had a losing season. The Nebraska Men's Gymnastics team is one of the most successful teams in the nation with 8 national team titles and 41 NCAA event titles. Ten huskers have gone on to represent the United States in the Olympics. The Huskers compete in the Mountain Pacific Sports Federation, along with fellow Big 12 conference school Oklahoma. Bowling has been an official varsity sport at Lincoln since the 1996-1997 season. Before bowling became a varsity sport, it was a club sport coached by Bill Straub who led the club team to two national IBC titles in 1991 and 1995. Bill Straub was hired as the full time bowling coach and has led the team to three more IBC titles in 1997, 1999 and 2001. In 2003, the NCAA created a tournament for Women’s bowling and the Nebraska Women’s Bowling team has been one of the top college bowling teams since the start of NCAA competition, which the Huskers won the first two national titles in a row, came in third place during the third NCAA tournament and have won three of the first six NCAA tournaments. The huskers have been ranked in the top 5 teams since 1990 and have never been ranked below 17th place. The Huskers can be seen bowling at the East Campus Bowling Lanes. Rifle is classified as a co-ed sport by the NCAA and is currently classified as a women's sport at the University of Nebraska. Rifle got its start as an official sport of the university during the 1998-1999 season under coach Karen Anthony. The team practices and has meets at the 10-point indoor firing range located in the Military and Naval Sciences Building (ROTC). The current coach is coach Morgan Hicks who started in the 2007-2008 season. The team has had several invitations to the NCAA tournament and has won two individual national titles. Nebraska baseball has seen a resurgence in the past decade. After many years of being a perennial doormat, the 2000 Huskers became the first team in school history to advance to the Super Regionals in the NCAA tournament. In 2001 and 2002, the Huskers made their first and second appearances in the College World Series. Much of the success of these teams and the teams that have followed is due to the efforts of Dave Van Horn, who compiled a record of 214-92 while leading Huskers from 1998-2002. After the 2002 season, Van Horn left to accept a position at his alma mater, Arkansas ; assistant coach Mike Anderson became head coach. In 2005, the Huskers had their most successful season ever, going 57-15 and advancing to the College World Series for the third time in five years. In 2002, the Huskers moved into the friendly confines of Hawks Field at Haymarket Park , widely considered one of the best collegiate baseball facilities in the country. Since this move, the Huskers have seen their attendance break numerous records. In the 2005 Super Regional against Miami, an overflow crowd of 8,711 watched as Nebraska clinched their third trip to the College World Series. While 8 pitchers from 2007 left for the draft, the 2008 Cornhuskers team is the youngest for Mike Anderson with 15 newcomers. They started off with an 11-3 record and started strong in the Big 12 winning their first 4 series. They won 7 of their 9 series going 17-9-1 in conference play. From February 29 to March 18, the Huskers earned a 14 game win streak, the longest since 2000. Like '06, they slumped at the end goin 2-4 in the postseason and losing their own regional. They went 29-5-1 at home and 11-9 away from Hawks Field. They were ranked as high as #5 and ended in 3rd place in the Big 12. Jake Opitz, Mitch Abeita, and Johnny Dorn were selected to the All Big 12 First Team as Dorn also earned 3rd Team All-American honors. The past four regionals that Nebraska has hosted they have managed to reach the super regionals once which was in 2005. Women's college softball started at Nebraska in 1976, before it was an official NCAA sport. The Nebraska Cornhuskers lead the nation in the number of academic All-Americans. Nebraska also leads the nation in Academic All-Americans in football. At the end of fall 2008 sports season, there were a total of 260 academic All-Americans in all sports, all teams. In addition to the performance both on and off the field, the Nebraska Cornhuskers are also known for having proclaimed their fans "The greatest fans in college football". Above the main entrance to Memorial Stadium is the inscription "Through these gates pass the greatest fans in college football." In 2001, President George W. Bush observed, "I can't go without saying how impressed I am by the Nebraska fan base. Whether it be for women's volleyball or football, there's nothing like the Big Red." Football fans are known as The Sea of Red due to the overwhelming amount of red they wear. They have sold out every home game since November 3, 1962. The large crowds not only cheer for their team but will also applaud the visiting team as they leave the field at the end of the game. Nebraska fans are known for following their team on the road, such as in 2002 when 60,000 fans traveled to Pasadena to watch the Huskers play the Miami Hurricanes in the Rose Bowl and in 2000 when Cornhusker fans took over Notre Dame Stadium . Rifle is classified as a coeducational sport by the NCAA; however, it is classified as a women's sport at Nebraska.